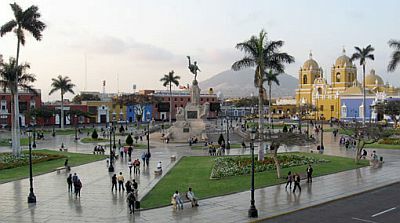 In Trujillo, Peru's third city, the climate is subtropical desert, with a warm season from January to March, and a relatively cool season from June to November. The city is located in the northern part of the Peruvian coast, in La Libertad region, and despite its location, about 8 degrees south of the equator, the climate is arid and very mild because of the Humboldt sea current; at this latitude the climate begins to resemble that of the Peruvian capital, Lima. The temperature range is very small: the temperature almost never drops below 10 °C (50 °F) on winter nights, while during the day it rarely reaches 30 °C (86 °F) in the summer months. The landscape in the area is practically desert, except in areas where streams flowing from the Andes are used to irrigate fields; to find some green areas you have to go the east, at the foot of the Andes. During winter, however, moisture can condense into mists and droplets that can be deposited on the ground (a phenomenon called garúa). Some night and morning fogs can not be excluded even in summer. The rains are definitely scarce: on average only a few millimeters of rain fall per year, and for long periods it never rains. Here are the average precipitation. The climate of Trujillo is affected by the cycles of El Niño, the phenomenon consisting in an abnormal warming of the Pacific waters: in the years of El Niño, the temperature of the air (and also that of the sea) increases, especially in the early months of the year, when there can be long periods with an almost tropical heat: for example, in February 1998 the average daily temperature has been 27.2 °C (81 °F), and in April 1983 it has been 27.5 °C (81.5 °F), with a maximum of 34.5 °C (94 °F). In contrast, as regards to the rains, they tend to remain scarce or absent also in these periods (while more to the north, in the regions of Tumbes and Piura, and partly also in the Lambayeque Region, see Chiclayo, in the years of El Niño rainfall increases as well). During the years of La Niña, the phenomenon opposite to that of El Niño, the winter temperatures drop below the average, and there are long periods with highs below 20 °C (68 °F) and lows below 15 °C (59 °F). The amount of sunshine in Trujillo is all in all decent in summer, while in winter, from June to September, it becomes quite mediocre because the Humboldt current can cause fog and low clouds. Usually, the sea in Trujillo is never very warm: it's warm enough for swimming in February and March, while it gets very cool from July to November, when it drops down to 18/19 °C (64/66 °F). However, in the years of El Niño, the sea in this area warms up a lot, especially in the early months of the year.